With no plans for April Fools this year all of the old roommates decided that we should have a party. 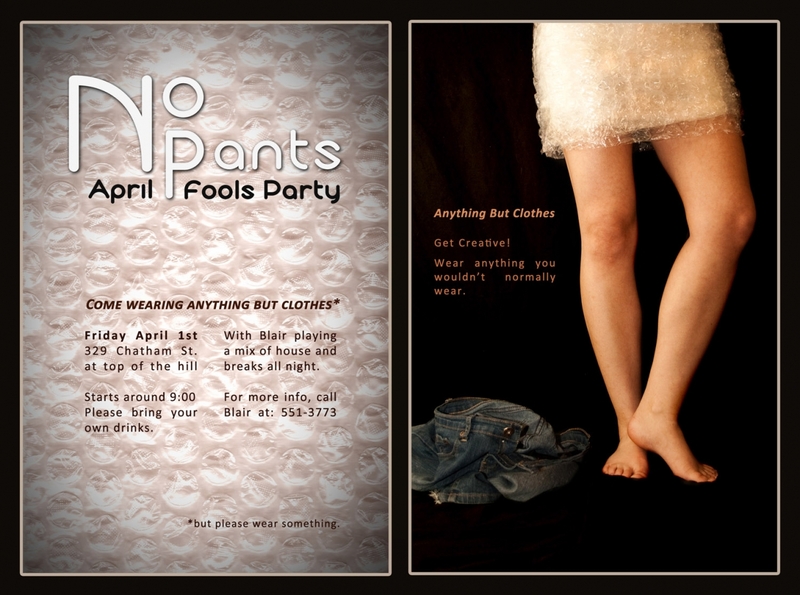 After throwing around ideas for a theme for an evening we settled on having an "anything but clothes" party which became the "No Pants April Fools". Of course, this one was going to have invitations to follow along with our No Expectations New Years party but what does one put on an invitation for a No Pants party? Well, you take pictures of your one female roommate without pants on of course. Thankfully Teylea didn't resist too much to this idea since it was obvious that man legs just weren't going to cut it. A few photos later and I sat down at the computer with her beside and photoshopped the rest of the invite. Once again I got to play around with a bit of text layout to create the title and decided that the most appropriate image for the front would be bubble wrap to compliment the bubble wrap skirt on the other side. I'm really happy with how this one turned out and after handing out about 50 of them around to friends and a few randoms we had a pretty good party. If I learned one thing from it though it is that making a pair of shorts out of fruit roll-ups is not a good idea without having a strong backing to put them on. My 'shorts' ripped to shreds right away and left me in a pair of underwear with the rest of me painted with glowing UV body paint the remainder of the evening. Fruit Roll-up shorts version 2.0 will definitely need some structural reliability testing done before going public.